“Banning glyphosate is likely to result in unintended consequences that ultimately impact on the environmental performance of food and farming businesses. 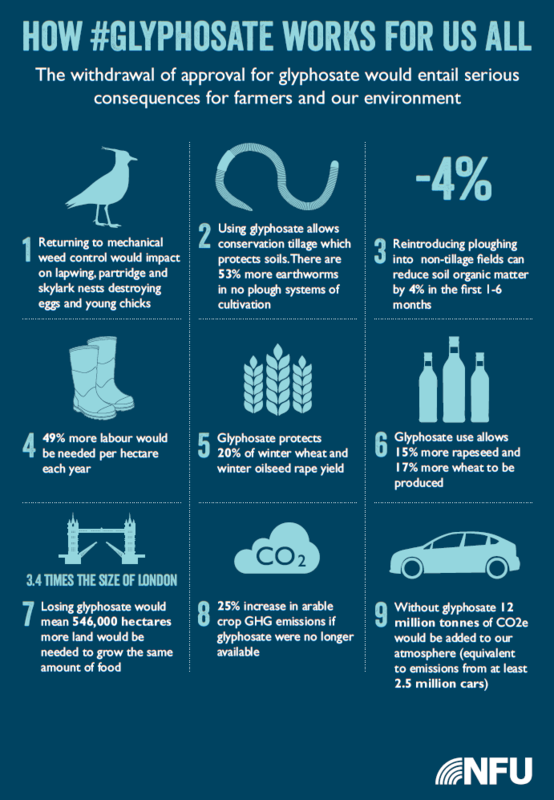 Some of these impacts are set out in the following National Farmers Union produced infographic. Why have a Water Stewardship Business Board? Business planning can be crucial for water stewardship, driving decision making that can ultimately make or break environmental projects. Tackling wide-scale issues (e.g. agricultural diffuse pollution) requires businesses to work together to change behaviour within supply chains. The CamEO water stewardship business board was established in late 2015 with representation from the agricultural supply chain within the CamEO catchment. These businesses all have existing water stewardship strategies and a shared vision for collaborative action. As the water company supplying clean water and recycling used water from more than six million homes and businesses in one of the fastest growing and driest regions in the country, Anglian Water knows just how vital water is to all of our lives. The availability of a secure water supply underpins the area’s growth, economy, agriculture, industry and its natural environment. Recognising the importance of water both now and in the future, Anglian Water launched their ‘Love Every Drop’ strategy in 2010, to encourage everyone who lives or works in the region to put water at the heart of a new way of living. In the UK, British Sugar’s operation is based on crops grown extensively across eastern England. Around 3,600 farmers contract with British Sugar every year and, between September and March, 7.5 million tonnes of sugar beet is delivered to one of four factories in the country (travelling an average distance of 28 miles). British Sugar’s operations are vast within the CamEO catchment, with farmers growing and supplying sugar beet to either Wissington or Bury St. Edmunds where it is refined. This process is extremely sustainable and circular with traditional waste products all being used productively. Cambridge Water has recently joined CamEO and will be discussing how, together, we can safeguard the water supply for Cambridge and the surrounding areas. “Cambridge Water supplies water that abstracted from the underground chalk and recharged by rainfall to a population of over 300,000 in the South East. We operate in one of the driest and fastest-growing areas of the UK with increasing environmental pressures on water availability and raw water quality. The Company is committed to ensuring a secure reliable supply of high quality water into the future, whilst providing customers excellent customer service and fair bills. Elveden Farms is a large grower of root vegetables and salads using abstracted water for irrigation to support these crops. Water is essential for crop quality and marketable yield. As a LEAF demonstration farm we take every opportunity to demonstrate how we manage, schedule and understand water use in our soils. We supply water based on plant needs, so understanding key physiological stages is paramount. We also demonstrate how we accurately apply water linked to demand and ensure our water use has long term sustainability. Hutchinson’s is a family owned company specialising in the supply of agronomic advice and inputs to 8000 growers throughout the UK. Working with research organisations and multinational suppliers, our technical team evaluates the different innovations coming to the UK market and develops bespoke agronomic solutions which are then adapted by the 180 agronomists to the specific requirements of each field where we give advice. The move towards Sustainable Intensification requires a rebalancing of the priorities as society’s expectations evolve, and water quality is a key priority for our agronomists. Climate change also brings its own challenges and agronomic practices must anticipate these new growing conditions, with water a key enabler for any yield enhancement. The National Farmers Union (NFU) champions British farming and provides professional representation and services to its Farmer and Grower members, ensuring that 70% of full time farmers have a voice where it matters.